This PDF 1.6 document has been generated by PScript5.dll Version 5.2.2 / Acrobat Distiller 9.0.0 (Windows), and has been sent on pdf-archive.com on 08/11/2011 at 01:00, from IP address 68.52.x.x. The current document download page has been viewed 1090 times. home for a fraction of the price of buying a single pie. showing up with all types of offers trying to bribe you to make another! I guarantee you they’ll be “WOWED” by this one. You To Make Another One Of These Delicious Pizza Pies. can’t order this pizza at “any ole” pizza parlor. 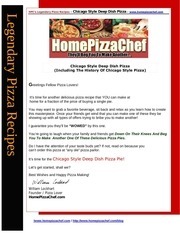 It’s time for the Chicago Style Deep Dish Pizza Pie! Best Wishes and Happy Pizza Making! “your special discoveries” in the margins. print it out before you roll up your sleeves and begin using it. informational storage or retrieval systems without the express written consent of the author. oil and cornmeal) that is formed to a deep round pan and pulled up the sides. with meats and/or vegetables such as Italian sausage, onions, and bell peppers. Rush Street, opened its doors, and 12 years later in 1966, Gino's East opened. grandsons and has 26 Chicago area locations). pressed to the sides of the bottom crust. its crust is quite thick -- a cross between the buttery crisp crust and focaccia. to a thin-crust pizza with a thicker and larger crust. enough to be soft and doughy on the top. to give it a try, I'm absolutely convinced that you will love it! OK….NOW Let’s make A Legendary Pizza Pie! pizza we’ll use a well-seasoned pizza sauce. The sauce will be flavorful and fullbodied to add to the traditional characteristics of the Chicago Style pies. By The Way…. Need Pizza Making Accessories? made with 100% dedication to quality and natural flavors whenever possible. and, of course, our world famous Jelly Belly jelly beans. Jelly Belly newsletter gives subscribers advance notice of such specials at least twice a month. Mix the above dry ingredients for 10 minutes in a strong mixer or knead by hand. If you’re doing this by hand…20-30 minutes of kneading will create a great crust. hook or by hand, an additional 10 minutes. Now the dough must rise. appear to have increased in volume. than 100) and let the dough rise in the bowl in the oven, covered by the towel. walls of the high sided pan. mushrooms, chopped onions and additional toppings to satisfy your taste. Sprinkle lightly with grated Romano or Parmesan cheese. complete the construction of the pie. Note, some pizza sauce from within the pie may seep unto the top of the pie. down your door to get a slice! See The Special Offer Below…. This file has been shared by a user of PDF Archive. Document ID: 00034944.